Down in the garage in a nice freestanding cupboard, about 1.8m high x 0.8m wide. There's also some spill over into the cupboard next to it. and loose pencils are stored mostly in these plastic paper filing drawer sets. In side each drawer I have folded up paper inserts (acid free paper, archival grade glue, etc) to organise the contents. Again storing by brand. Trays are double layered and can easily be taken out. Basically I've still got to re-box things, but then it's pretty much done. I have been silent for a long time now. I would like to say that the rest has refreshed me, and that my muse has returned, but it hasn’t. However, I get occasional flashes of inspiration, like last weekend when I was moving the collection to its new home in a nice big storage cupboard. I was rearranging the Lamys, Rotrings and a few others and was struck by the variety of boxes they used. Perhaps they are not so important to many collectors, but I’m sure for many people who are buying a writing instrument above the everyday price range, then a nice presentation package or box is part of the decision making process, particularly if it is a gift. 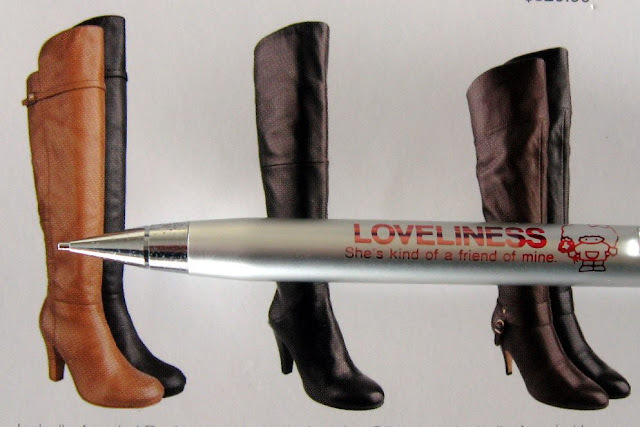 From some catalogues I have, it seems that most writing instrument sellers have a standard range of packages and boxes, and within reason retailers have some choices to do some mix and match of boxes, particularly within the business ranges offered to corporate gift buyers. So, here’s a quick selection of packages from my Lamy collection. Lamy are a company who pride themselves on design and innovation, and some, though not all, of their packaging matches that. A clear plastic cigar tube sort of container. I really quite like this one. Very unusual. Black foam, split in two with a hole drilled down the middle for the pencil to fit into. This is the sort of thing that sets Lamy apart. I am surprised they do not do more of this unusual type of packaging, although it is not terribly functional. A clear plastic package with silver-paper binder. Unusual, but I’m not so sure I like it that much. 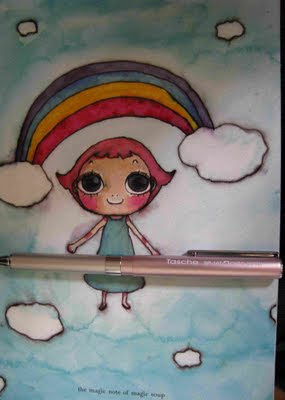 Let’s say it is a little bit too economy class when matched with a Lamy. These cardboard packages are a staple of the Lamy range. The grill-like cut-outs are some attempt to set them apart from others. These plain metal containers are another common offering from Lamy, and lots of others too. Plastic cases are another common alternative to the metal cases. Nice enough, but nothing special. A more expensive and less common plastic case, double hinged. A somewhat more retro case on an older pen-pencil set. Another older item, with a cardboard case with elastic binder. This may not be the greatest post to make a return with, and the photography may not be the best, but hey, I had some inspiration, 10 minutes spare time and Arnie’s comment gave me a kick in the pants at just the right moment. So there you have it. Some of you will have previously visited Jonathan Veley’s pencil museum (link in the sidebar). Well, Jonathan recently contacted me to tell me his book on American Pencils will soon be published. You can see some details about the book on and sign up for a copy on his website. While there, do visit the mechanical pencil museum, and take a look at that opening image. Bow down in wonder and awe! All Hail the Wall of Pencils! Well, a big international event is coming soon to my hometown and country, so here's a little brain-teaser for you. Kind of a cryptic Jeopardy. Instead of a normal Jeopardy where I give you the answer and you guess the question, the pictures are a clue to the answer. So, what then is the question? Sorry, there's no prize. You are just competing for honour and glory. PS - I am thinking normal blog transmission will resume in another month or two. From far away, and an embarrasingly long time ago, a parcel arrived in my letterbox. Amongst the contents was this interesting little fellow. The Koh-I-Noor 5608 Notebook 2mm mechanical pencil. The 115mm length and 7mm diameter belie it's rather surprisingly substantial presence in the hand. Thats clearly an effect of the knurled grip zone and its weight to size ratio from all that metal componentry. It's an ordinary push top ratchet mechanism pencil, but the lead is an 80mm length of 2mm diameter. Only one lead fits in the pencil, there is no spare carried inside. A replacement lead is fed in through the tip rather than in through the top end. 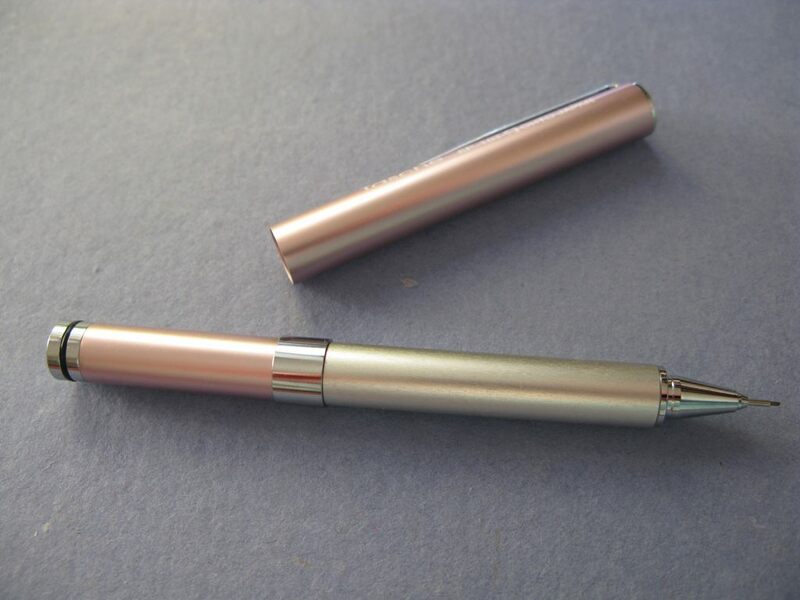 Although not my favourite size, 2mm lead would suit many for writing quick rough and ready notes, particularly where thinner leads might get broken from the rough and tumble of being carried around in a bag, or where the writing situation is not ideal. There is no eraser under the top cap, rather it unscrews to reveal a lead sharpener. It's a particularly vicious looking little sharpener. Lots of nasty little fangs to attack the lead. Just FYI - you can unscrew things and remove the pocket clip. Thanks to Nick from Hungary for sending this to me. Here we have the last of the feedback from the Dave Turns Five Giveaways. The Grand Finale Prize, a shopping spree at Cult Pens to the value of £150 was won by "Stell" and here now is an article she has sent in about her prize. So, over to Stell. Disclosure : this pencil was part of a prize in the celebrations of Dave’s Mechanical Pencil Blog turning Five. Why did I choose the Wörther Slight Pencil? Well ‘back in the day’ I worked in a Engineering drafting office (the early 1980’s), when mechanical drafting pencils came in 0.3, 0.5, 0.7 and 0.9mm and each draftsman was issued with a complete set on day one. We were also issued with two 2mm clutch pencils. 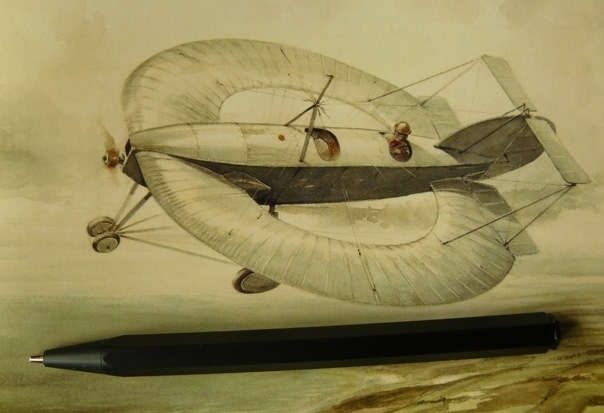 All drawings were completed using the mechanical pencils, selecting the lead size for different thickness lines on the drawing to indicate different materials or construction details. Final drawings were inked in, using pens with the same line thicknesses. Those pencils were held perfectly vertical and rotated as one drew lines to ensure the line was always of a constant thickness. 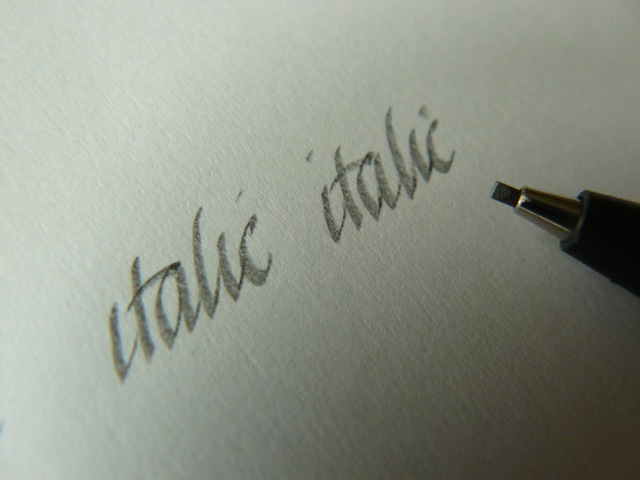 Any text or writing was done with a 2mm pencil. I left engineering for academia in the late 80’s but I just can’t bring myself to use a pencil in the sub 0.9mm category for anything other than technical line drawings, even though I know that a 0.5mm lead has become the default standard for most mechanical pencil users for writing. I simply enjoy the line variation that a 0.9 and 1.18mm pencil provides when writing and sketching. When I spotted the Wörther Slight Pencil at Cult Pens, I was curious to try out a modern production 1.18mm pencil, and I’m so glad that Dave’s birthday celebrations provided the impetus to order one. The Wöether Slight comes packaged in a stylish, almost too stylish grey cardboard box. 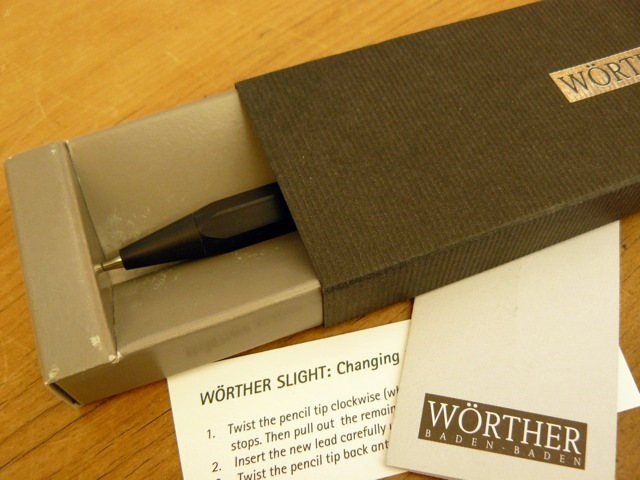 The outer sleeve is in fine ribbed corrugated cardboard with the Wörther logo centred in reverse silver. The sleeve slides open to reveal a sleek black pencil and two information cards. Everything about this packaging is elegant and in keeping with my understanding of current EU regulations on manufacturers responsibility on providing packaging and products that are recyclable. There is not a plastic tie, band, or bag to be seen, only cardboard. Right on top was a small thick white card detailing the 3 steps to replace the leads. In an era where what Dave calls ‘keep on clicking’ 0.5mm pencils dominate the market, having this information readily available is probably a good move. The reverse of the card has the same instructions in German, well I suppose they are the same as German is not one of my languages. Also on top of the pencil is neat little folded card explaining the pencil is manufactured by hand, to a high standard, comes with a world wide guarantee and a ‘wish for great pleasure with Wörther products’. 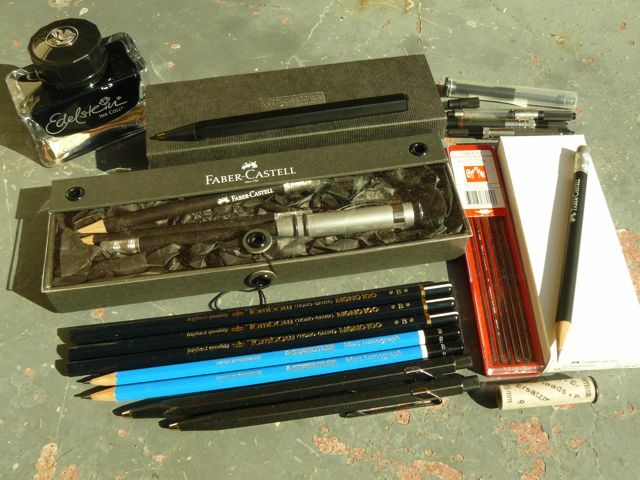 There is a link to the Wörther website which lists some lovely pencil products. That site was enough to make me wish for an executive desk on which to display such things. But what about the pencil? Well the first visual impression is that it is a classic pencil shape, hexagonal with a sharp taper at the writing end just like a wood cased pencil. Picking up the pencil there is a sense of weight, of quality; the pencil is metal and weighty, at 18g. My heavier vintage fountain pens weigh in at between 19.4 and 24 g, and a wood cased Faber-Castell 6B at 5g. The Wörther Slight feels substantial, cool to the touch, smooth and heavy, but is of course much thicker than a wood cased pencil, at 9mm diameter is more like a fountain pen, or significant ballpoint/roller ball pen. The Wörther Slight is available in two finishes, Aluminium and Black. I ordered the Black with some slight apprehension about the matt black marking with finger smudges, but after several weeks of constant use there are no noticeable smears or marks. Unlike many mechanical pencils there is no special grip section or grip area. You can hold the pencil anywhere that suits you best, if anything the pencil is too smooth, initially the cool metal finish felt very smooth, almost slippery, but after using the pencil for a few weeks I realised that even though it felt slippery it wasn’t. This is a sleek pencil, with no pocket clip. Many pencils have pocket clips to prevent them rolling off a desk, as well as to clip them to pockets, but as this is a hexagonal pencil there is no risk of desk roll. I don’t clip pens and pencils to my self, in the past I have even amputated clips from some cheaper plastic pens and pencils because I disliked the way the clip interrupts the design. The lack of a pocket clip was something I liked about the Wörther (YMMV). The balance point is 65mm from the tip, exactly half way, making for a nicely secure feel in use. The Lead, a 1.18mm, is advanced by a twist mechanism, as is common in many vintage pencils taking this size. To advance the lead you twist the nose cone of the pencil until enough lead protrudes for your use. A firm hold is required to twist the nose cone enough to advance lead, which may annoy if your fingers are not so nimble or are perhaps prone to slipping. The twist mechanism isn’t always obvious on vintage pencils, on some the mechanism is cap activated (push-click) or the twist mechanism is at the non-writing end of the pencil so there is always a sense of discovery as one works out how to advance the lead. The supplied lead is soft, possibly a 2B. Replacement leads are available from Wörther, in the same grade as supplied with the pencil, Autopoint 1.1mm leads fit and are available in H, HB, as well as Blue, Red and Green. Scripto leads fit and come in H, B, 2B, and CX supersoft leads, as well as Red, Green and Blue. 1.18mm leads are not commonly available where I live but are easy and affordable to buy online, and vintage and usable packets are often found ‘in the wild’ in antique or used goods shops. Spare lead access, is at the non-working end of the pencil where there is a hexagonal plug, with Wörther and Germany etched on it. This is the only branding on the entire pencil, unlike much of the commercial pencil offerings which are branded, bar-coded, logo’d and have lead sizes and other information liberally applied to the entire surface of the pencil barrel, and clip. 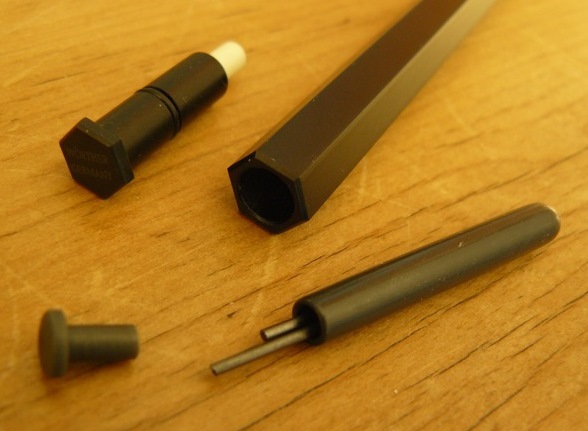 Removing the hexagonal plug reveals an eraser so small that it could only be considered an emergency eraser and a black rubber tube plugged with a grey stopper. This tube contains spare on-board leads, and prevents the classic mechanical pencil rattle sound from occurring. 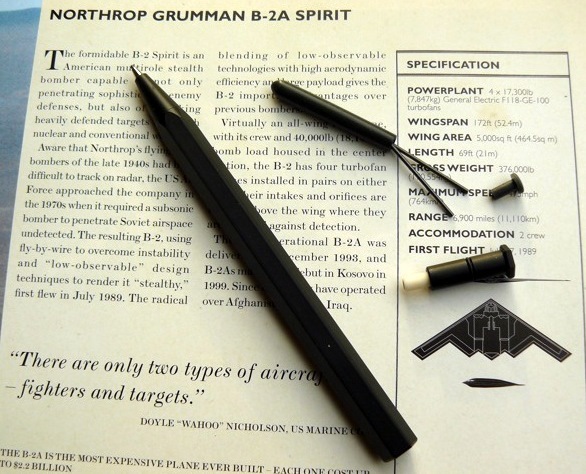 I can’t help but think of this as a stealth pencil, rugged, silent, and dark. Leads are replaced by removing the old lead stub, fully retracting the lead mechanism and inserting a new lead thru the nose cone before tamping it home gently with a firm push against a hard surface. Second impressions, after a few weeks of constant use. The all-important use test. The pencil has a conical lead sleeve so is a writing and free-drawing pencil rather than a drafting or technical pencil. The supplied lead is soft and generous so writes like a classic wood cased pencil, but can be sharpened or rotated to write with a fine line. What I like about 1.18mm leads is they are thick enough lead to last a while and to give you options. 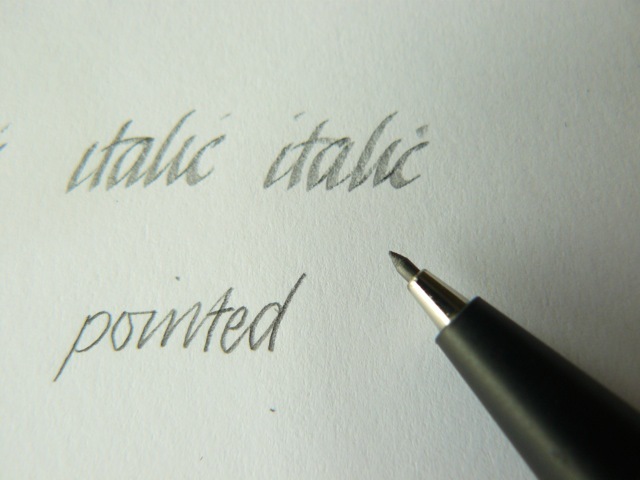 I have been known to use a lead pointer to sharpen the lead to a point, or drafting sandpaper block to smooth the lead to a chisel suitable for italic writing. My only negative comment about the pencil is that the hexagonal shape is sharp, the edges are very noticeable when handling the pencil but not at all noticeable when using the pencil, so hardly bears mentioning. In contrast my Black Fixpencil 22 is a similar shape and material but far slimmer and the edges are much more rounded. Did this pencil live up to my expectations? Good question, as well as my drafting office inititation into the world of quality mechanical pencils, my expectations were also based on a small collection of very nice vintage pencils I have and use daily. My collection consists of a few Conway Stewart Duropoints, a Scripto, Parker 51 pencil, two Burnhams, some Autopoints, a Koh-i-nor, and a Fixpencil. All those are well made, comfortable to use and by their age alone have stood the test of time and use. The Wörther Slight certainly feels like it is in the same league in terms of build quality and durability. Compared to my vintage pencil collection there is a different aesthetic with the Wörther Slight, it is without a doubt a markedly more modernistic pencil, showcasing ideas of form follows function and total absence of any decoration in the design. If I was at a meeting and some one borrowed my Wörther Slight to jot down a note or two… I can imagine their sense of discovery that this uber-conservative pencil was a lot more than they expected. The Wörther Slight is already one of my favourite pencils and I expect it will age well. 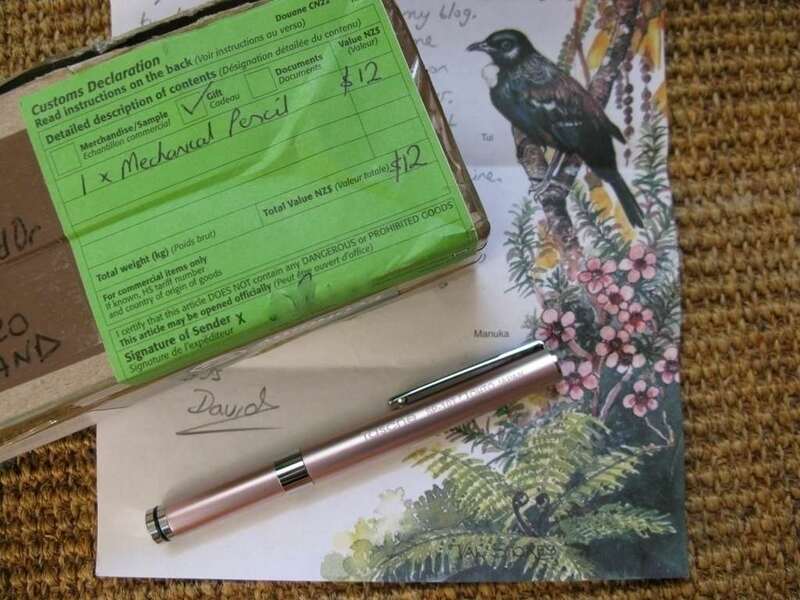 Again – a huge thank you to Dave and his blog, to Cult Pens, and all Dave’s blog followers which allow me to experience not only the Wörther Slight but also to indulge my love of quality writing instruments at a technical geek level. Thanks Stella, a great read, and I'm glad you enjoyed the fruits of your shopping spree. Stella also sent in this photo of the whole spree. Dave. Just FYI, you might want to visit this newish blog, Freds Pencils. It's primarily wooden , but mechanicals get a look in too. Palimpsest was the winning girl in the 5th Birthday Giveaway 1, and she has kindly sent in a few words and pictures of her winnings. So, over to Palimpsest. How wonderful to get a parcel in the post – and with a handwritten letter too. Many thanks to Dave’s Mechanical Pencils. The pencil within is the Tasche SP-10T Ohto Japan. 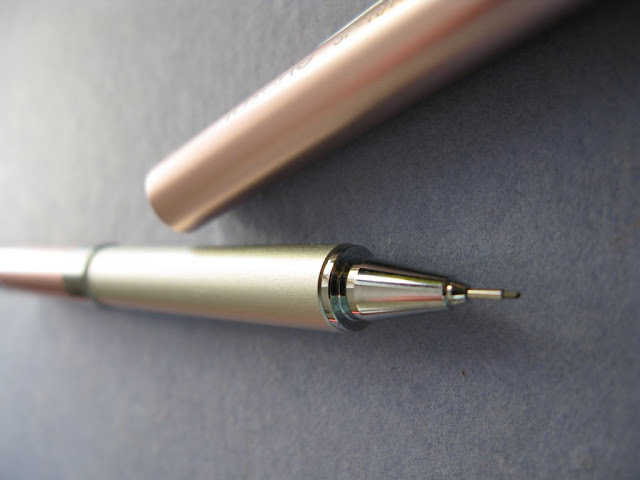 A mini mechanical pencil just over 100mm long but post the cap and it becomes a full-sized writing instrument. Cap and barrel are made of aluminium – lower part of the barrel is silver, the other half and the cap is a smoky pink. The tip, trim and clip are chrome. Unscrew the top and a mini eraser is revealed. Performance? The Tasche SP-10T Ohto is a smooth writer producing a nice dark line. There is one disadvantage. The top of the barrel is a wobbly affair. By pressing it down a fresh pencil tip is revealed. When it doesn’t serve that purpose it rotates freely to the annoyance of this user. When the cap is posted the barrel is inadvertently pressed down to produce more pencil lead. This can be prevented by holding on to the chrome ring rather than the barrel when posting. Eraser is so tiny that it must be used in emergencies only. But then trembling hands can hardly cope with the fiddly task of unscrewing the top. And it takes more than 5 seconds to complete the task. Still, the mini Tasche is a winner for portability and smooth writing. And as all mechanical pencils it promises to go where no pencil sharpener can follow. 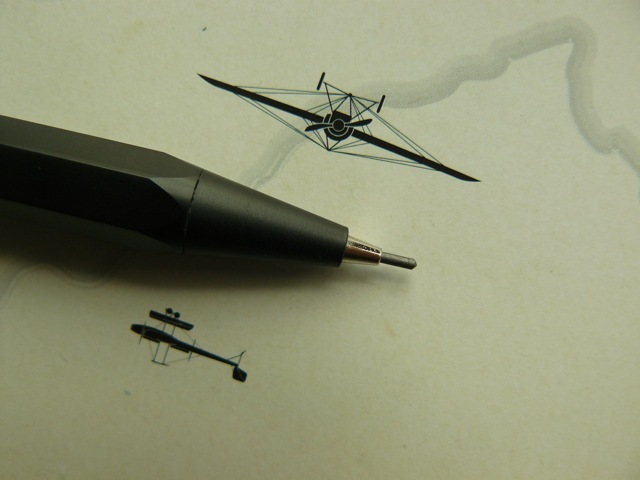 Just FYI, for anyone interested, here's my review of the Ohto Tasche mechanical pencil.